Moms like me would agree that having safe drinking water af home is essential for optimal health. While preparing the healthiest and most nutrient-dense food for the family is important, it only ranks second to sourcing the best water options. Water makes up 70% of our body weight and we need water for proper hydration on top of transporting nutrients to essential systems of the body. Hence, forming a habit of drinking a lot of clean water on a daily basis is beneficial. Safe drinking water in the household should be our top priority. Sometimes, water sources do contain hundreds of chemicals and impurities that affect your health plus the taste, color and smell of your water. Water filtration then becomes necessary so that none of these are absorbed from the water. Water filter systems reduce a significant number of contaminants and improve the water’s overall quality. Torayvino maybe your best water option on your kitchen counter. TORAYVINO™ is a home water purifier series that combines Toray's developed hollow-fiber membrane and activated carbon technologies. 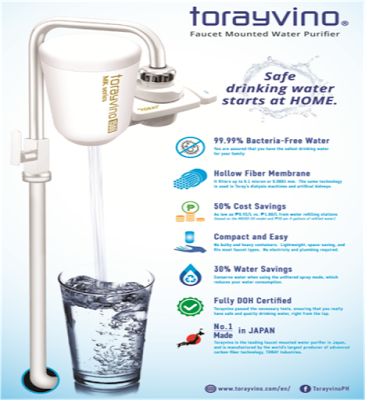 Torayvino compact faucet-mounted water purifier is a filtration system from Japan that could eliminate disease-causing bacteria such as amoebiasis, cholera, and diarrhea, among many others. This easy-to-use faucet water filter system removes the widest range of contaminants. A spigot attaches near sink for easy use. The water filter is compact enough to fit in an individual’s palm, but works perfectly at filtering out chlorine and other substances that might bring about any untoward smell, taste, or turbidity (color) in your water. To top it all, essential minerals like calcium, magnesium and other essential minerals that are naturally found in water are retained as water undergoes a stringent filtration process. Torayvino produces 99.99% bacteria-free water through a 4-stage filtration system: impurities bigger than 465 microns, such as rust, sands, sediment and particles are removed in the ore-screen stage. Those bigger than 114 microns impurities that couldn’t be removed by prescreen, will then be taken away in the second screen. The granular activated carbon strongly removes residual chlorine, harmful chemicals, and bad odor; while the hollow fiber membrane precisely removes contaminants in the 0.1um unit such as bacteria, rust, turbidity, coliform bacili, microorganisms, and microscopic impurities. As the water passes through the granular activated carbon, it efficiently removes residual chlorine, harmful chemicals and bad odor. Finally, the optimal hollow fiber membrane structure removes contaminants larger than 0.1 micron, such as bacteria and other microorganisms, rust, turbidity, and microscopic impurities. Such technology, which is likewise used in dialysis machines and artificial kidneys, provides low elution and high flow rate of water. A Torayvino faucet-mounded water filter could provide up to 1,500 liters of purified water. That’s about three to five months of regular use for a household with four individuals. After that, you need to change the cartridge only. Torayvino MK303 retails at P1,980 while the cartridge costs P1,380. This means clean and safe drinking water costs only P0.92 per liter, as opposed to about P1.85 per liter from water-refilling stations. Torayvino comes from a company called Toray Industries, Inc. Established in 1926, it has presence in over 20 countries (including USA, UK, China), with some 46,000 employees. It has a 66 percent market share among faucet-mounted filtration systems in Japan. 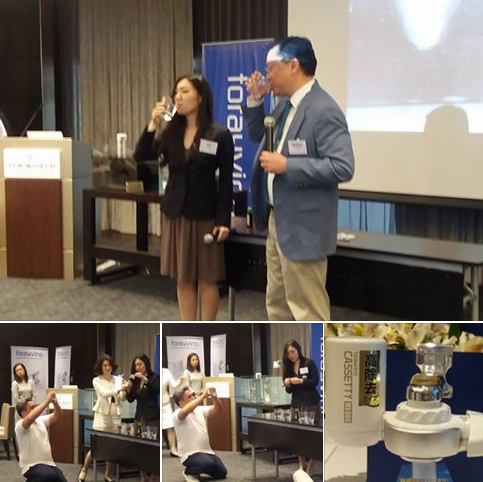 Torayvino Water Purifier conforms with the Japan Industrial Standards and is also certified and approved by the Philippine Department of Health. It is distributed in the Philippines by Moduvi, Inc. and maybe purchased from True Value and All Home. It would be much safer to have a water purifier and also be cheaper in the long run than buying mineral water. yes, it is cost-effective in the long run to invest on water purifiers instead of buying purified water all the time. it is good that we know have a number of afforadable options out in the market. It's the first time I've heard of this brand of water purifier..Thanks for sharing. I thinks its my first time hearing this brand too. Looking forward to hear more of this water purifier. We drink water straight from the tap. I don't know if the water purifier would make a difference for us.